rec. St. John’s Church, Elora, Ontario, Canada, 27-30 January 2005. The singing of Psalms is perhaps the bedrock of the Anglican choral tradition. After the Protestant Reformation, the settings of Psalm texts evolved from simple plainchant, to a harmonized chant that follows a specific formula. As a general rule, Anglican chant is made of two sequences of ten chords, and the verses are “pointed” so that the cadences of the music fall within the natural speech rhythms of the text. Although it looks incredibly simple on the printed page, Psalm singing can be devilishly difficult to do well. Here is a choir that succeeds in making what can often be turgid service music come alive and be vital and inspiring. For variety and interest, Noel Edison and his choir have interspersed chant settings with through-composed choral works, all on Psalm texts or adaptations thereof. In all, this is extremely satisfying, although I would fault Mr. Edison for throwing in a few selections long tired from over-use. In spite of that quibble, there is much here to be enjoyed. The choir sings with a sure and even tone, immaculately in tune and with a fine sense of rhythmic motion and drive. Edison’s tempi are well chosen, and he never lets the music bog down, particularly in the chant settings. Items that shine: John Goss’s chant setting of Psalm 127, Herbert Howells’ gorgeous anthem O Pray for the Peace of Jerusalem, and William Croft’s Funeral Sentences stand out as true gems. Items that could be left at home: William Mathias’s dreadful anthem for Charles and Diana’s wedding Let the People Praise Thee O God. This is such contrived music that if I never hear it again it will be too soon. And, although Parry’s famed coronation anthem I Was Glad never grows old, it’s a bit of a cheap shot to include something so Hollywood. Small complaints aside, this is very fine singing, and Matthew Larkin’s skill at the console is beyond reproach. 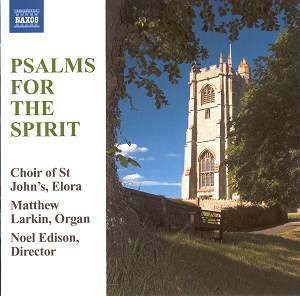 This disc is one in a series of Psalm collections on Naxos, and it is a worthy addition to any collection. Anglican choristers will find the music very familiar, and will appreciate hearing a fine choir sing such familiar music.